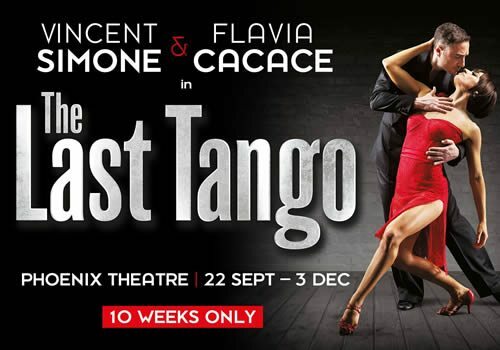 Following an extensive UK tour, Strictly Come Dancing’s expert dancers Flavia Cacace and Vincent Simone bring their final show The Last Tango to the Phoenix Theatre for a limited season. With huge success surrounding their previous productions Midnight Tango and Dance ‘Til Dawn, this toned-down, more intimate production celebrates more than twenty years of the pair dancing together. Opening September 22nd, The Last Tango follows smash-hit Guys and Dolls. The Last Tango follows George as he delves into an attic packed with past memories. Told through a mesmerising variety of dance, including rumba, jive, flamenco, salsa and tango, the action is accompanied by a live band. Whereas past shows have seen a grand and complicated storyline, The Last Tango is a more intimate and emotional show, celebrating Cacace and Simone's time as dance partners. Having both taken part in competitive dance, specialising in Ballroom and Latin, Flavia Cacace and Vincent Simone have danced together for twenty years. Both appeared on Strictly Come Dancing as professional dancers, and both are World Dance title-holders, best-known for being champions of the Argentine Tango. Directed by Karen Bruce (Annie Get Your Gun, A Chorus Line), The Last Tango is produced by Adam Speigel Productions. Opening at London’s Phoenix Theatre, this vibrant and vivacious dance show smashes into the West End for a limited run between September 22nd and December 3rd 2016. Don’t miss out on the pair’s last show together in this explosive experience! Suitable for families of all ages, this is a great way to introduce young people to dance!